You are not alone! You come from a long line of strong girls—girls who struggled to know God and to follow his plan, just as you do. 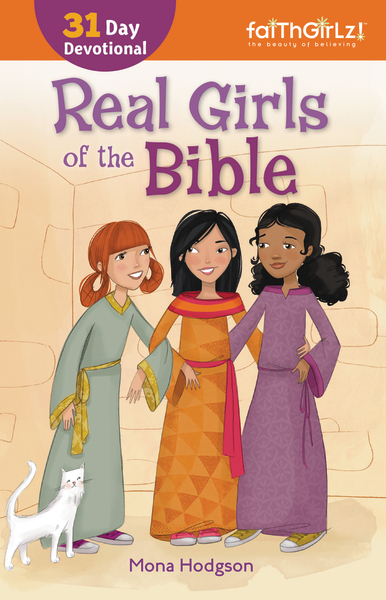 A Faithgirlz book, Real Girls of the Bible features 31 stories about real girls from the Old and New Testaments. Just like you, each of these girls had to find her place in the world, and though your worlds are very different, you’ll find that many of the struggles were the same—like fitting in and struggling to do the right thing. Each devotion includes Scripture, prayer, Body Talk, and more. Discover what the Bible has to say that can guide you on your faith walk. Especially designed for ages 8-14. “I loved reading Real Girls of the Bible by Mona Hodgson. She told each real girl’s story in her Bible setting and made Scripture come alive. I especially enjoyed the application as the Bible girl might have shared with today’s girls.